Come get fresh strawberries straight from the farm. During Daylight Savings Time we’re open from 8 am – 8 pm, and in the quieter months 9 am – 5.30 pm. During the off season, hot house strawberries are available. Please be aware that adverse weather conditions may cause strawberry shortages at times. 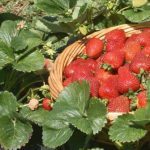 We grow strawberries with quality and flavour, sold fresh from the farm gate. We’ve been doing it for over 20 years now, and we know how to grow a mouthwatering strawberry. The expertise to create a great strawberry begins months before they reach you. Soil preparation has to be just right, and we feed our plants NATURAL fertilizer. Healthy happy plants grow yummy plump strawberries. Years of experience, growing different varieties of strawberries helps us to provide consistent quality of flavour in our strawberries. Portland Strawberries are always farm fresh and the majority of our sales are from the farm gate. Come visit us and our farm and see what we have to offer. We always have strawberries ready to be sold fresh from the farm, as well a range of local and gourmet pantry on our shelves. Taste the difference! Portland Strawberries Liqueur is a fortified wine a blend of our sweetest strawberries with quality Brandy Spirit in itl Available in tall waxed 375ml bottle or a 375ml screw cap bottle. Can be sipped after a meal, mixed with champagne or added to desserts or sauces. You will be impressed with this smooth fortified blend of truly stand out product. Also available strawberry chocolates, strawberry jam,lollies to mention our extra produce. Good – I should certainly pronounce, impressed with your site. I had no trouble navigating through all the tabs as well as related information ended up being truly easy to do to access. I recently found what I hoped for before you know it in the least. Reasonably unusual. Is likely to appreciate it for those who add forums or something, website theme . a tones way for your customer to communicate. Excellent task.